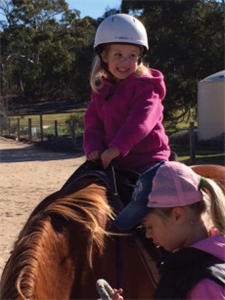 Do you have a Little Person in your house that's just BUSTING to ride a horse? We can help make it happen! If you have a group or party that loves ponies why not hold it at our place? Use our kid-safe play area, kids club house and café facilities to hold your event and hire one of our staff and ponies to highlight your day! If you have a group of children keen to ride - why not make it a party with 2 hours of Pony Riding Games with lolly prizes, and morning tea. We dedicate 2 hours of riding activities, but there's no set time limit for sitting back and allowing your child to run amok and enjoy our indoor Club House facilities and outdoor play equipment, safely enclosed with a "child-proof" fence! Morning/afternoon tea catered for everyone's enjoyment, and you can purchase an espresso coffee from our Café to complete the decadent experience! Recommended for 2 years and over.